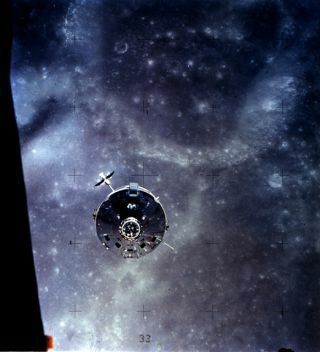 The Apollo 16 command module is viewed from the lunar module during its approach for the final rendezvous of the mission. In this historic photo from the U.S. space agency, the Apollo 16 Command and Service Module (CSM) "Casper" approaches the Lunar Module (LM). The two spacecraft were about to make their final rendezvous of the mission, on April 23, 1972. Apollo 16 astronauts John W. Young and Charles M. Duke Jr., aboard the LM, were returning to the CSM in lunar orbit after three successful days on the lunar surface. Astronaut Thomas K. Mattingly II was in the CSM.